The nice people at Folksy have made me their featured shop this week. This means items on their front page (scattered about at the top, and then lots at the bottom), Facebook mentions and articles in the Folksy Blog. All rather lovely. 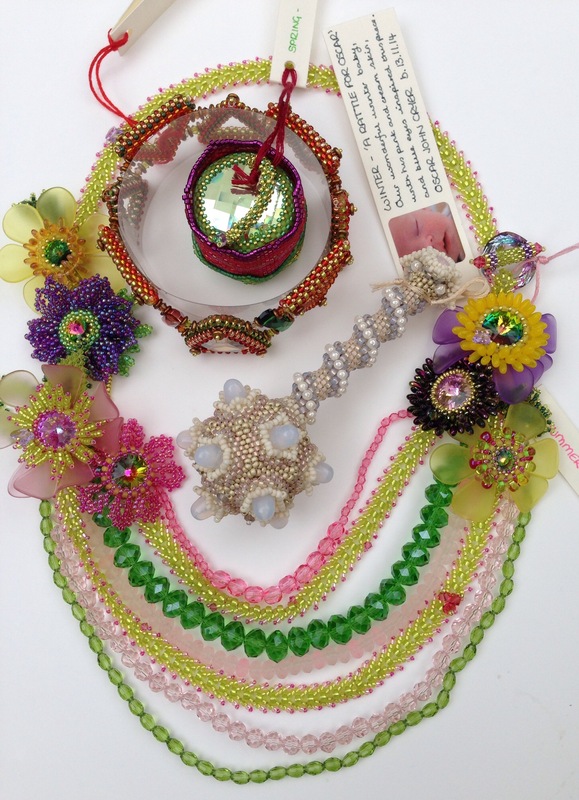 Plus the Facebook mentions have stirred the interest of other beaders including my idol Jean Power, so I’ve even sold some tutorials. More lovely people – thank you all. 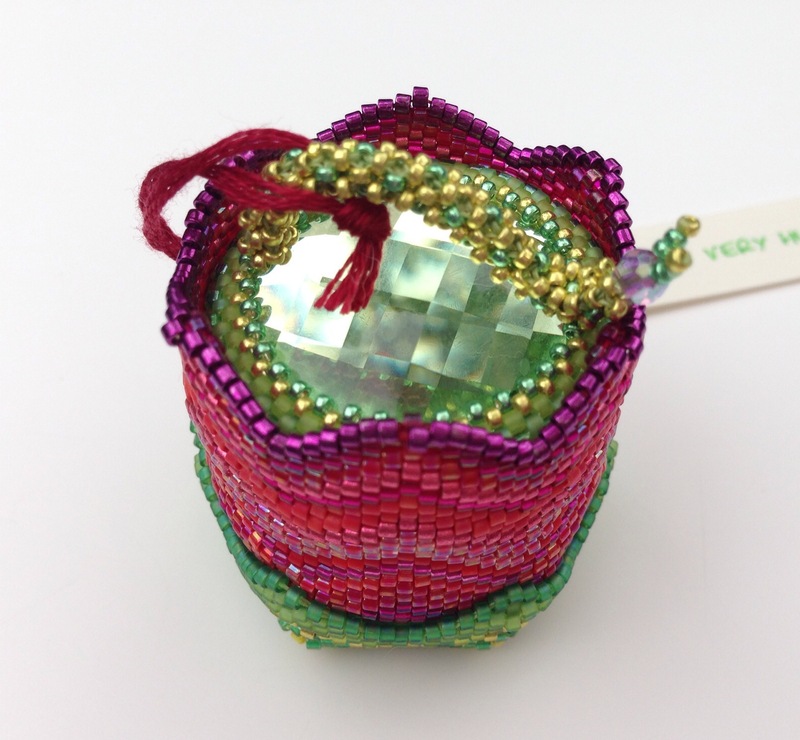 While we were on holiday I decided it was high time I made something for me – beading recently has been about competitions and the shop, rather than stuff for myself. As every beader knows, we are the strange people who have something to match perfectly with every outfit, and I seem to have acquired new clothes without beadwork to match. Chief among these are my new and very silly trousers (under the bangle above) from Boden, and whilst I rarely get to wear jewellery because of the littlest boy, their colours seemed to present an opportunity for something very loud. This isn’t quite as daft as it seems – I wear them with a plain navy blue top so some colour is needed to balance things out a bit. I made a little pendant with some fluorescent pinks, blues and magentas, but it was still a bit dwarfed by the trews. Something truly epic was called for – and with some extra time courtesy of a few rest days at my parents with the boys, I finally felt ready to attempt a bigger piece from Contemporary Geometric Beadwork. I dug out a PDF they issued last year for the ‘Mowgli’ Zig Wing Bangle, and a big box of beads. The modified RAW band is lovely. However, you will end up holding it while you bead, so make sure you use beads with a very permanent finish. I think I grabbed the first silvers I found, and they were galvanised so they’ve lost a little sparkle. Their small/medium (5 points) is quite big. If I make another I might drop some repeats from each side. The written instructions don’t quite match the diagrams for the beginning of the second side. Follow the diagrams, the words will give you about 4 extra rows – not the end of the world, but time-consuming, possibly affecting the sizing and probably not as nice. Another time I think I will skip the ‘slipper’ join and shaping on the inside layer, and instead just zip that part together. It feels like this would make a better base for the outer layer and show that fantastic shaping with less distortion. I didn’t keep a full count of hours – at a guess I’d say around 20? Certainly a reasonably big job compared to my usual pendants and earrings, but a lot quicker than expected. Also actually much easier than expected – is basically plain peyote with some herringbone increases and decreases. I’ll be honest and say I didn’t find the instructions hugely clear – I can’t quite identify exactly why, but they do make the piece seem more complicated than it is. However the diagrams are good, with thread paths at critical points, so most intermediate beaders should manage fine if they concentrate! I’m going to pop some drops or even seed beads into the RAW band at the point where the decreases will go next time, as they will form a nicer corner than delicas. Kate recommends soft tension. She says this a lot and she is quite right! However this is tricky with delicas, and even trickier with matte beads. Try to relax, the fitting and shaping (as well as the finished feel) will be easier if you do. All in all, I’m pleased. I’ll certainly have a go at another big piece from CGB ( now I know they are easier than they look), and I await CGB 2 with eagerness. If I am feeling really energetic I think I will treat myself to one of Barbara Brigg’s patterns from Etsy – they look incredible and should I think be nice and clear. 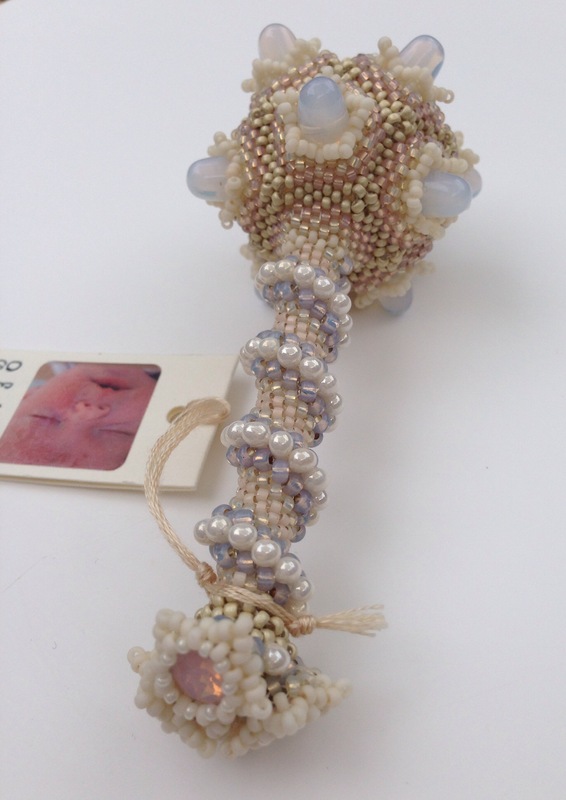 When I get a minute I will update with the finished weight so you can see what kind of volume of beads is involved. Last week was our annual holiday with my extended family in North Norfolk. The boys had a wonderful time on the beach with their cousin and grandparents, and in a few rare quiet moments we managed some beading. Here you can see me in blue stripes whizzing up some more feather earrings for the shop, my nephew Ben loom banding (nearly beading), and my little sister Susie (who I taught to bead a few years ago) making a series of CRAW loops which she eventually looped together using a loom band technique to make a fabulous bracelet. 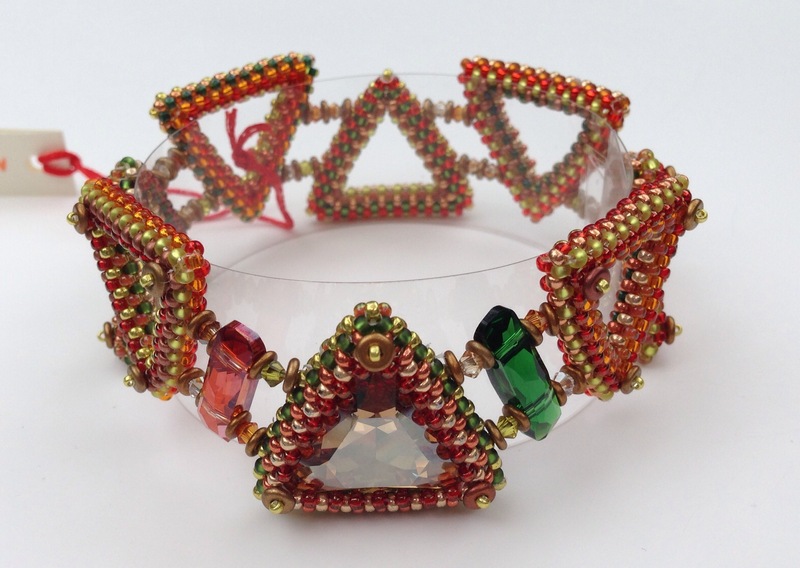 Later on in the week I finally plucked up the courage to commit to a Zig Wing Bangle (from Contemporary Geometric Beadwork) and it’s going well – piccies soon.